The genus Escallonia includes approximately 40 species of flowering shrubs from South America. Several types are grown as garden shrubs in the south and west of the UK, especially near the coast. They are relatively fast growing and make unusual evergreen hedges because they bear a profusion of attractive and often honey-scented pink, crimson or white flowers throughout the summer and autumn. The blooms contrast with the glossy dark green leaves, some of which have a slightly spicy smell when rubbed. In the south of the UK, and in the sheltered parts of the western isles of Scotland that are warmed by the gulf stream, Escallonia is fully evergreen and tolerates situations that are exposed to salt-laden sea breezes. However, they do not do well in places exposed to cold winter winds, and the combination of these with sub-zero temperatures will often cause them to drop their leaves. This article looks at choosing, planting and looking after Escallonia plants as hedges, specimen shrubs and in patio containers. This red-flowering Escallonia is probably the best species for tall, evergreen hedging as it grows quickly and is easy to manage. It is popular along the south coast as it does well in sandy soils and is very tolerant of salty sea winds. This grows into a large white-flowered shrub, up to 3m tall with a spread of 3.5m. It is not fully hardy in the north of the UK, and benefits from the shelter of south facing wall. Numerous varieties have been developed, many of which have won the Royal Horticultural Society’s Award of Garden Merit. Escallonia ‘Apple Blossom’ is compact and bushy, with large, candy-pink and white flowers that have an apple-blossom scent. It is only fully hardy along the south coast, and is generally grown as a handsome specimen shrub. Escallonia ‘Donard Seedling’ is a vigorous shrub that is good for hedging. Its characteristic pink buds produce bright pink and white bell-shaped flowers and has very glossy foliage. It is one of the hardiest of the varieties and can be grown well to the north of the UK as long as it is protected from cold winds. Escallonia ‘Iveyi’ is relatively hardy, and bears masses of fragrant white flowers from June through to October. With appropriate management it will grow into a dense hedge that provides good privacy and wind protection to the garden. Escallonia ‘C.F. Ball’ has bright red flowers and is amongst the hardier varieties, tolerating winter temperatures down to -10°C or even -15°C, so long as it is sheltered from the worst of the cold winds. Other Award of Garden Merit winning varieties include ‘Langleyensis’, ‘Crimson Spire’, ‘Donard Radiance’, ‘Peach Blossom’ and ‘Pride of Donard’. While Escallonia’s popularity is mainly due to its flowers, there are also varieties available with attractive variegated foliage. These include E. laevis ‘Gold Brian’, a small shrub with golden foliage and red flowers, E. laevis ‘Gold Ellen’, which has gold and green leaves that contrast with its red flowers, and Escallonia ‘Silver Anniversary’, which has leaves with pale silvery margins. Escallonia rubra ‘Pygmaea’ has a compact and rounded shape that makes a perfect specimen shrub on rockeries or other small sites. It has handsome, crimson-red flowers. ‘Gwendolyn Anley’ is another small variety. It is relatively hardy and bears pink flowers. Some of the modern dwarf varieties such as Escallonia rubra ‘Pygmaea’, ‘Pink Pixie’ and ‘Pink Elle’ grow to only 80cm to 100cm in height, and they are ideal for growing in pots or other containers on the patio, though they do not have the strong fragrance associated with some of their larger cousins. trouble-free shrubs. Most varieties establish quickly, and in the first few years will grow rapidly at up to 40cm to 50cm per year. As a hedging plant, they are best suited to taller hedges at 2m to 3m high. To facilitate rapid root establishment, they should be planted in a single or double row at 30cm to 40cm centres. From the second year they can be trimmed as necessary, but to ensure good flowering, the main hedge cut should be immediately after flowering has ceased. As with any hedge, to maintain basal growth, good form and privacy, always trim to a pyramid shape with sloping sides that are wider at the base, rather than to a box profile. This makes sure that light can reach the leaves nearer ground level and helps to keep the whole plant green and dense. Once established, Escallonias do not appreciate their roots being disturbed, and they should be placed in their final positions as early as possible to avoid the need to move them. Escallonia prefers an open position that is in full sunlight throughout the day. Summer watering is important for getting Escallonia established in the first two years after planting. The soil around the roots should be kept moist, but not waterlogged. Light rain in summer is unlikely to be sufficient to keep young plants happy, and watering is especially important in dry, windy conditions. They can also be watered occasionally in very dry periods in their first two winters, though not when there is a possibility of frost. Escallonia has fairly catholic tastes when it comes to soil. It does best in a fertile, light soil, but the plant will grow quite happily in sandy, loamy or even clay soils whether they are acid, neutral or alkaline, as long as they are well drained. Once established, the shrubs will not generally require much attention or feeding. However, when preparing the ground for new plants, make sure the soil is well dug, friable and well-draining, and improve the fertility by incorporating a generous sprinkling of fish, blood and bone into the planting hole and into the soil that you use for backfilling. This helps the root growth to get a good start. Plants grown permanently in containers will need some supplementary feeding with a general purpose fertiliser once a week during the spring and summer to promote regular flowering. The ability of Escallonia to tolerate a wide range of planting conditions means they also do well in patio pots. However, even the smaller varieties are quite fast-growing, so they will need to be re-potted each year as they increase in size. Always use a well-drained and humus-rich compost mix, and the pots need a good basal drainage layer of old broken crocks. The containers should be kept on pot stands to allow water to drain freely from the base. Water the pots regularly through the summer, but ensure that the compost does not become waterlogged. Escallonia is fairly low-maintenance, though to be grown as a neat hedge or formal shape they will require clipping at least once a year, preferably after flowering. Otherwise, they do not generally need pruning. If they do out-grow their allotted space and require some gentle control, it is best to prune in the autumn. Spring pruning will reduce flowering for the rest of that year. Well-established shrubs will recover well from hard pruning if that does prove to be necessary, but this should be done in spring at the expense of flowering to allow the new growth to harden prior to winter, as the new growth is likely to be more frost-prone. If a plant does succumb to frost or cold winds after a heavy pruning, it is likely to regenerate from the base, so all is not permanently lost. Escallonia can be propagated by taking softwood cuttings in the spring, or hardwood cuttings in late autumn after flowering. For softwood cuttings, choose a healthy, young parent plant with plenty of new growth. Find a long length of new growth that is just starting to turn woody at the base, and remove this with a clean, sharp knife. Trim the cutting to about 10cm, making the lower cut in new growth just below a leaf joint. Remove all leaves from the lower half of the cutting and any flower buds. The cuttings do best in a free-draining compost, such as a 50:50 mix of potting compost with sharp sand or perlite. Softwood cuttings establish rapidly if kept in a sheltered position and they will show good root growth within one to two months. Keep them well watered. They can be kept in the pot in a sheltered position, unheated greenhouse or cold frame for the first winter, though in favourable south coastal locations where they can be sheltered from cold winds and kept frost-free they can be planted out in the autumn. Hardwood cuttings are taken from old wood in the autumn. Put these into pots of well-watered cutting compost or a general purpose, soilless compost and overwinter them in an unheated greenhouse or cold frame. They will have rooted by the following spring, when they can be planted out into their final position in the garden. Water them well until they are established. Most types of Escallonia are best propagated from cuttings, but the seeds of some of the more unusual varieties such as Escallonia pulverulenta are available from specialist suppliers. This rather rare garden shrub is worth trying from seed, as it has unusual downy stems and sticky green leaves, and dense candles of white flowers up to 20cm long. 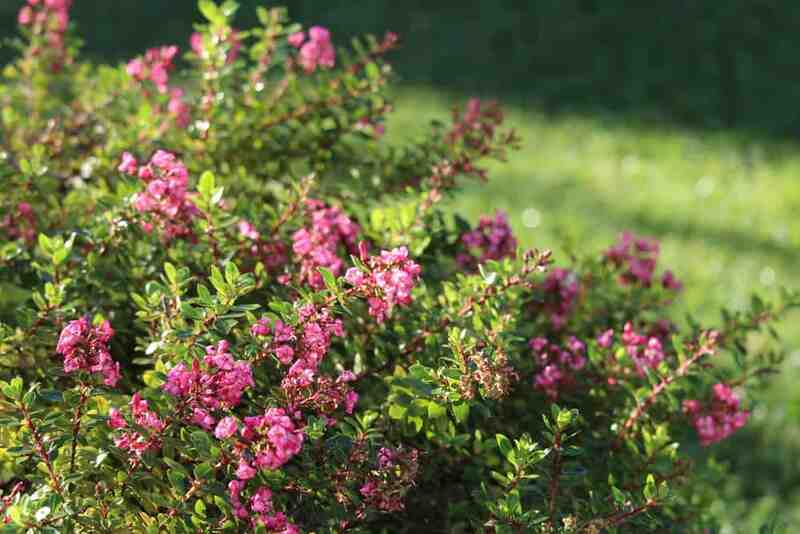 Escallonia is generally pest, disease and virus free. The tall, rapidly growing species types such as E. rubra are prone to leaf discolouration and are not always truly evergreen, as they can suffer a yellowing then a loss of most of the older leaves, potentially leaving the lower part of the shrub rather bare through the winter and early spring. Leaf discolouration and loss is exacerbated by exposure to cold winter winds. In this weakened condition they also become more prone to fungal leaf spot. The affected plants develop yellowing of the foliage, and purplish-black spots with white centres can appear on some of the leaves. In severe cases, many of the leaves may be lost. It is most likely in a wet summer, and on plants growing in cramped, poorly-ventilated locations. Affected growth should be cut back and destroyed. Similarly, remove and destroy all of the fallen leaves from around the base of the plant or hedge. If the plant is looking generally unhealthy, feed it with blood, fish and bone and keep it well watered at the roots (but not on the foliage) to try to give it a boost. While these more susceptible species are suitable for informal hedging, it is better to avoid their use in more formal clipped hedges and as specimen shrubs. More modern cultivars are less prone to extensive yellowing and leaf drop, and provide much tidier shrubs in the garden. Choose one of the varieties that has the Royal Horticultural Society’s Award of Garden Merit, and if necessary buy from a specialist nursery rather than the local garden centre. Q Is Escallonia only suitable as a hedging plant? Escallonia certainly makes a good, affordable hedge, and is often seen growing around gardens in southern England and Ireland as a coastal windbreak, thanks to its tolerance to salty sea air. However, it is a very versatile plant and the best varieties can also be grown as a specimen shrub in the garden border, providing scent and colour. It responds well to shaping, and can be trained up walls and trellises, or grown in a variety of forms, such as espaliers. The smaller varieties can be used as specimens on a rockery, perhaps with dwarf conifers, and in a patio pot or container. Escallonia can be combined with other shrubs in mixed mass plantings, and it works well with Genista, Berberis, Viburnum, Cotoneasters and the taller Hebes. Its glossy green foliage makes an excellent backdrop for colourful mixed and herbaceous flower beds. For example, it sets off tall perennials such as Lupins, Hollyhocks, Verbenas and Delphiniums beautifully. As a typical seaside plant, it also works well at the rear of dry gravel or pebble gardens, where it will provide a contrasting backdrop to sea holly, rockroses and sea pinks. Q I was on holiday in Jersey and there was a shrub in the hotel garden by the beach with bright red flowers that was covered in bumble bees. I was told it was an Escallonia. Would it be good for my wildlife garden at home? Escallonias of all types seem to be a real favourite of bumblebees, no matter what the flower colour. The blooms also attract honeybees, butterflies, hoverflies and other pollinators, so the shrub will be great for your wildlife garden if you can find a suitable position that is protected from cold winter winds. There are not many other evergreen shrubs that attract beneficial pollinating insects to this extent, so it is a wildlife-friendly addition to any garden as a hedge as well. Q I need an evergreen hedge and I need it quickly. I am thinking of trying Escallonia. Can you give me any advice? If you are looking for a rapid and dense privacy screen, then Escallonia may be a good choice. Make sure you get a variety that is suited to your geographical location, and check its hardiness with the nursery. Once established, hedging plants will grow about 30cm per year, and they will reach 3m in height if you want them to. Otherwise, they are best kept trimmed to 2m high hedges. You should be able to buy plants at any time of year. Small plug plants and bare-root plants should be avoided for your purposes, and for a rapid effect and optimum chances of success, go for container-grown plants as these can be planted all year round and will establish most quickly. The optimum planting season is from September to May. If you plant out in the summer, make sure that you water three times a week, especially in warm, dry weather. Prepare the ground by weeding thoroughly, digging over to loosen the soil, and add a little blood, fish and bone and garden compost. Ideally plant through slits in a length of garden geotextile to keep the weeds down and the ground moist, or apply a good mulch of garden compost or well-rotted manure after planting. Space the plants approximately 35 cm apart. Water well in the evenings at least two or three times a week until established, and ensure they are kept weed free for the first year.